Old King Doran, known in legends as the Last Hero or the Everlasting One, is the founder of Great Boletaria and resides in the royal family mausoleum below the Boletarian Palace. He is a demigod charged with protecting both the royal family and the sword Northern Regalia which is the fusion of the otherworldly swords Demonbrandt and Soulbrandt. It is unknown who forged the Northern Regalia but legends say it was left in the world at the same time as the Old One for malicious purposes. Old King Doran wears the one-of-a-kind Ancient King's Armor and wields a soul-form version of the Northern Regalia. 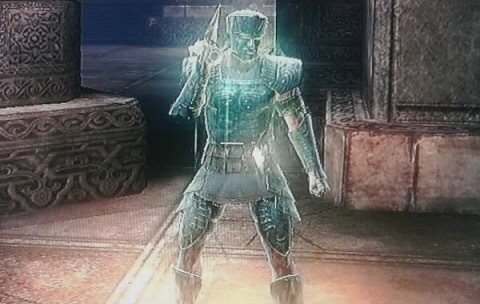 Once the Mausoleum Key has been obtained from Ostrava, Doran can be found in the first area of the Boletaria Palace behind the Red-eyed knight. Though Doran wields a version of Northern Regalia, the physical sword was split in two. The white blade Demonbrandt, which "banishes that which befouls man" grows more powerful the purer the soul who wields it and was left behind in the crypt by King Allant. The black blade Soulbrandt, which "banishes man himself" grows more powerful the more demonic the soul who wields it and has not left the hand of King Allant since he gained knowledge of the Soul Arts. A soul-form version of the black blade is later held by the False King Demon doppelganger. If the player proves they are worthy by besting Doran in combat, he will allow them to take the sword Demonbrandt to aid in the quest to defeat King Allant. Thou who seeketh the King's sword! I am the Old King. Show me thine strength and the strength of thine souls. Thou dost well to impress one such as me, young knight. I am Old King Doran, and thou hast proven thine strength to me. Go forth, and take the King's sword in thine hand. I am the Old King. Dares't thou to challenge me? Very well. But may thou be determin'd from the depths of thine heart, else thou shalt fail. May fate be with thee. Carved agalmatolite key. Opens the Boletarian Royal Family Maosoleum. The demon-rending blade passed down through the Boletaria Royal Family. It is a white blade that forms a matching pair set with Soulbrandt. It is particularly effective on demons. Old King Allant spurned the blade for the way its power increased the less demonic the wielder's Soul became. The Soul-rending blade passed down through the Boletaria Royal Family. It is a black blade that forms a matching pair set with DemonBrandt. After Allant rose to the throne, it was always in the king's hands. Old King Allant favored the blade for the way its power increased the more demonic the wielder's Soul became. Legacy of the Old Boletaria Kings. The shadow this sword casts is of both the Soulbrandt and the Demonbrandt. but it is said to have been left in the world along with the Old One for malicious purposes. An old bronze ring held by Old King Doran. Boleteria, lives on forever as a demigod. 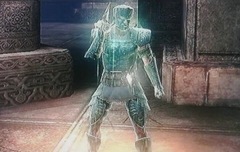 The bronze [armor] of the demigod Old King Doran. Here in Boletaria, we speak of the legend of The Two swords and the Last Hero. The Two Swords, are Demonbrandt and Soulbrandt. One sword banishes that which befouls man, and the other banishes man himself. The Last Hero is Old King Doran. 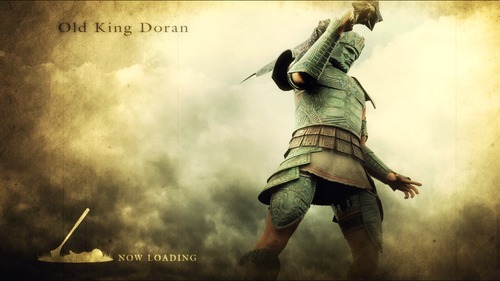 King Doran is the everlasting one, founder of Boletaria and protector of the Two Swords. Hah hah, of course, only according to legend!